I love autumn. There’s a chill in the air that begs me to fire up the oven. For the past couple of months, I’ve been on a mission to find a great white bread recipe. I’ve tried dozens from well known cookbooks and famous foodies. I started searching on Pinterest, and put out a plea for some help with my quest. Within minutes, I had an email from a sweet cousin in Phoenix…with a recipe…that turned out to be the best white bread I’ve ever made. We baked up a batch on Sunday, and within an hour we had devoured two loaves, hot and drizzled with honey. We transformed a loaf tonight into grilled cheese sandwiches and dipped them into steamy tomato soup. Tomorrow’s breakfast will most likely be toast with raspberry jam. Mix hot water, honey, oil, salt and yeast together in mixer. Add 5 cups flour. Mix until smooth. Change to dough hooks. Add 5 more cups of flour. Beat well. Add more flour 1/2 cup at a time until dough doesn’t stick to the side. Mix on high speed for 6 minutes then turn mixer off. Let rest for 12 minutes. Form into 4 loaves. Put in greased flour pans. Place in oven, turn oven to warm and let rise for 20 minutes. Increase temp to 350 and bake approx. 25-30 minutes. Remove from oven and brush tops of loaves with melted butter. Now, where should I focus my recipe searching energy? When given the choice between two flavors of dessert, my heart is always torn. How can I turn down either one? Especially if they are both homemade. When I got my copy of Martha Stewart’s Everyday Food in the mail last week, this recipe caught my eye. With this cake, I wouldn’t have to choose. Two flavors in one slice. A bite of rich chocolate from one corner, delicious vanilla from the other. Preheat oven to 350 degrees F. Butter four 2 x 6 inch miniature loaf pans and line with parchment paper. Bring cold ingredients to room temperature. Butter should be soft enough to hold a thumbprint but still keep its shape. In a large bowl, using an electric mixer, beat butter and sugar on high until light and fluffy, about 6 minutes. Beat in eggs and yolks, one at a time, until combined. Beat in vanilla. In another large bowl, whisk together cake flour, baking powder, and salt. With mixer on low, add 1/3 of the flour mixture, beating to combine. Beat in 3/4 cup of the buttermilk, another 1/3 of the flour, the rest of the buttermilk, and the rest of the flour mixture. Beat until just combined, scraping down the sides of the bowl as needed. In a medium bowl, combine the cocoa powder and hot water. Stir half of the cake batter into the cocoa mixture. Spoon 2 dollops of batter into pan next to each other, 1 chocolate and 1 vanilla. Repeat twice, alternating layers (chocolate on top of vanilla and vice versa) and swirl. Bake until a cake tester comes out with a few moist crumbs attached, 40-45 minutes, rotating pans halfway through. Let cool completely in pans on wire rack. Run a knife around edges, then turn out cakes. These are my very favorite cookies (right now). They are deliciously spiced, and just chewy enough. The perfect treat to go along with that cold glass of milk. In the bowl of an electric mixer, combine the shortening, sugars and eggs. Add vanilla. Combine flour, soda, salt, and cinnamon in a small bowl. Add to creamed mixture. Mix in oatmeal. Let mixture sit for 5 minutes or so and then mix again. Bake on parchment lined baking sheets for 10-12 minutes. (They spread so I bake them 6 at a time on large cookie sheets). The edges will become golden brown but the middles will look underdone. Cool on pan on wire rack for 5 minutes. Remove from pan and cool completely on racks. Makes 2-3 dozen. Note: Do not double. If you want to make a lot of these (who could blame you? ), just whip up a second batch of dough. It will only take a minute. Beat well. Hold cookies by outside edges and dip upside down in icing. This recipe comes from a dear friend and incredible baker. I took a cookie making class from her years ago. If I ever see her on the schedule again, I’ll let you locals know. Surprisingly, one of the treats that has haunted me were these buttery little orange biscuits that The Cyclist found at the OXXO across the street from the hotel. He would buy an orange foil wrapped sleeve of these cookies every day and they were gone before we left the pool. As I have also mentioned my affinity for all things orange, it may not come as a surprise that I have actually lost a bit of sleep trying to figure out how to recreate these at home. In the bowl of an electric mixer fitted with a paddle attachment, mix together the butter and 1 cup of sugar until they are just combined. Add the vanilla and zest of 2 oranges. In a medium bowl, sift together the flour and salt, then add them to the butter-and-sugar mixture. Mix on low speed until the dough starts to come together (it will be very crumbly. I generally just smush it all together with my hands towards the end of the mixing). Dump onto a surface dusted lightly with flour and roll the dough into two logs, about 2 inches in diameter. On a large plate, combine the 1/2 cup of sugar with the additional orange zest. Roll each log in the sugar mixture and then wrap in plastic and chill for 30 minutes. Preheat the oven to 350 degrees F. Slice each log into 1/4 inch slices. Bake on parchment lined baking pans for 12-15 minutes, until the edges just start to brown. Cool on wire racks. Store, tightly covered, at room temperature. I love baking with bananas. I have several banana bread recipes that I rotate through, depending on my mood (and available ingredients). Here are three more new favorites. These are all fairly healthy (thanks to the addition of fat free yogurt and ground flaxseed). 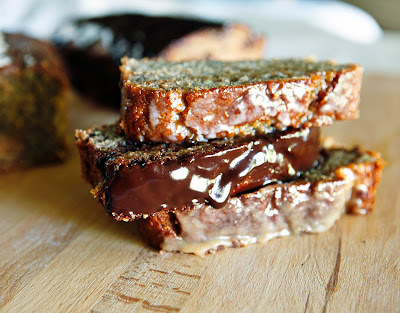 But they are still a treat (thanks to the addition of peanut butter, chocolate, or a simple, sweet glaze). Combine banana, yogurt, butter and eggs in a large bowl; beat with a mixer at medium speed. Add granulated and brown sugars; beat until combined. Lightly spoon flour into measuring cup and level with a knife. In a medium bowl, combine flour, flaxseed, soda, salt, cinnamon and allspice. Add flour mixture to banana mixture and beat just until blended. Pour batter into a 9 x 5 inch loaf pan that has been sprayed with cooking spray. Bake at 350 for 55 minutes of until a wooden pick inserted in center comes out clean. Remove from oven; cool 10 minutes in pan on a wire rack. Remove from pan; cool completely. Combine powdered sugar and milk, stirring until smooth. Drizzle over cooled bread. Combine banana, yogurt, butter and eggs; beat with a mixer at medium speed until blended. Add sugars; beat until blended. Lightly spoon flour into dry measuring cups; level with a knife. Combine flour, flaxseed, soda, salt, cinnamon and allspice in a medium bowl. Add flour mixture to banana mixture and beat until just blended. Fold 1/3 cup of the mini chocolate chips into the batter. Pour batter into a sprayed 9 x 5-inch loaf pan. Bake for 55 minutes, or until a wooden pick inserted in center comes out clean. Remove from oven, cool 10 minutes in pan on a wire rack. Remove from pan and cool completely on wire rack. Combine remaining 1/3 cup chocolate chips with milk in a microwave-safe bowl. Microwave on HIGH for 30 seconds, then stir until smooth. To prepare bread, combine banana, yogurt, peanut butter, butter and egg in a large bowl. Beat with an electric mixer until blended. Add granulated and brown sugars; beat until blended. Lightly spoon flour into measuring cups and level with a knife. Combine flour, flaxseed, soda, salt, cinnamon and allspice in a small bowl. Add flour mixture to banana mixture; beat until just blended. Stir in nuts. Pour batter into a 9 x 5-inch loaf pan that has been sprayed with cooking spray. Bake for 1 hour and 5 minutes, or until a wooden pick inserted in the center comes out clean. Remove from oven; cool 10 minutes in pan on a wire rack. Remove from pan and cool completely on wire rack. To prepare glaze, combine powdered sugar, milk and peanut butter in a small bowl. Whisk until smooth. Drizzle over cooled bread. *These glazes remain pretty sticky. Once glazed, store any leftovers under a cake dome (or only glaze the pieces you are planning to eat right away). You do NOT want to lose any of the sweetness to your aluminum foil. Have all of the ingredients at room temperature before you begin. Position rack on lower third of oven. Preheat to 325 degrees F. Thoroughly grease and flour a 10 cup Bundt pan. Sift together flour, soda and salt. Set aside. In the bowl of an electric mixer, with flat beater, beat butter and cream cheese until creamy and smooth-30 to 40 seconds. Gradually add the sugar and continue beating, occasionally scraping down the sides of the bowl until light and fluffy-about 5 minutes. Increase the speed to medium-high and add the eggs, one at a time, beating well after each addition and scraping down the sides of the bowl. Beat in the vanilla and lime juice. Reduce the speed to low and fold in the dry ingredients in three additions, blending each addition until just incorporated and stopping the mixer occasionally to scrape down the bowl. Using rubber spatula, fold in the lime zest. Spoon batter into pan, making sides about one inch higher than center. Bake until golden and tester comes out clean-about 1 hour and 15 minutes. Let cool on wire rack in pan for 10 minutes. Remove from pan and glaze. Whisk together and generously brush surface of warm cake with glaze. Let cool completely before serving. Drizzle with raspberry sauce. Puree in blender. Press through fine sieve to remove seeds. The cyclist and I just spent a week, playing in the sun, with 40 of our favorite people. Yep, 40. Go ahead and count. Going anywhere with our six blonde daughters brings a lot of attention (open mouthed stares). Throw in another few dozen people and we were a traveling circus. Cream together sugar, shortening, sour cream, and egg. Add vanilla. Add dry ingredients and mix until combined. Roll into balls and bake at 425 degrees F on a lightly greased baking sheet for 5 to 7 minutes. They will be WHITE when done. Blend until smooth and firm enough to frost cookies. It was so hard to leave paradise and return to 30 degree weather. These cookies are easing the pain today. Since I was a little kid, I have always favored orange candies. When my girls open a pack of treats, they know to give me the orange skittles, runts, sour patch kids, gummi bears, what have you…. Orange has just always been my favorite. I’ll never forget the Christmas when my sweet husband filled my stocking with gummy orange slices, chocolate orange sticks, and only orange starbursts (picked out of several whole bags I’m sure). I think it’s my favorite flavor because orange always tastes like orange. Plain and simple. Well, these cookies have plenty of orange flavoring. The best kind…from about 5 real oranges. Combine and frost warm cookies. How about you? What’s your favorite “flavor”. And what is the best orange candy you’ve ever eaten? Here’s mine.